The TU/e Campus is a physical and virtual meeting place that connects people from inside and outside the university. We create an interface between knowledge and the market. Our ambition? To develop an ecosystem around our university that is geared to sustainable collaboration with small and medium-sized companies (SMEs) and industry. If research results are adopted by business and industry and converted into actual products, knowledge adds value. For successful collaboration TU/e is the place to be. Of course, companies are indispensable partners. 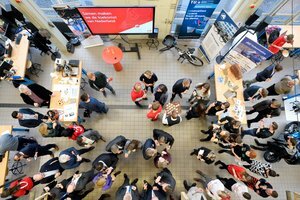 We also go that extra mile with them in joint research, with a leading role played by our Strategic Areas: Health, Smart Mobility and Energy, along with our Research Centers: High Tech Systems Center, Data Science Center Eindhoven en Institute for Photonic Integration. For example, we develop joint innovation programs and R&D roadmaps with companies like ASML, Philips, DSM and Heijmans. A unique form of collaboration is the Flagship in which research groups from TU/e work very closely with an industrial partner, such as Philips, on research into relevant technologies for urgent societal issues. Apart from fleshing out the fundamental research component, as TU/e we also take on the role of Living Lab, a test environment where new concepts can be tried out, tested and evaluated in real-life situations. Need temporary extra engineering capacity? What about our TU/e students? TU/e SURE Innovation has a large pool of excellent Master students that can be detached to strengthen a project team. Students can also be deployed during their studies, for instance in a PhD program or as part of the two-year PDEng designer program.